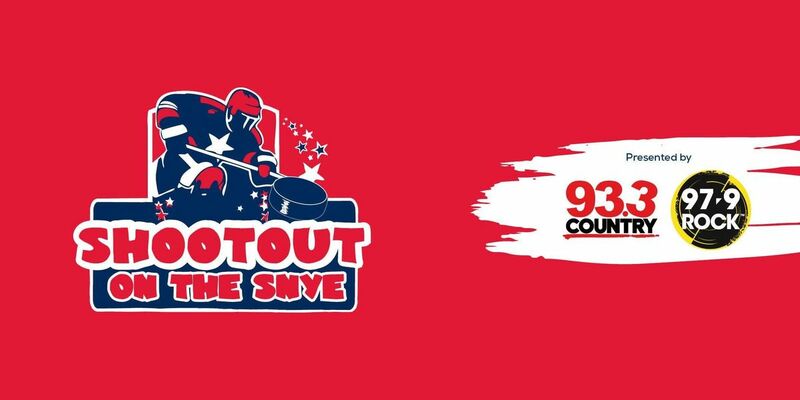 COME JOIN US FOR THE 12th ANNUAL SHOOTOUT ON THE SNYE! Presented by Country 93.3 and 97.9 ROCK. Shootout on the Snye is a four-on-four pond hockey tournament with a maximum of six players on each team (four players on the ice and two substitutes). Each division consists of one or two pool round robin(s), guaranteeing that all teams have three or four games (depending on division). There are no goalies in this tournament, as pond hockey nets are being used. This year every division will consist of an A tier and a B tier to add equity to the tournament. If a division does not have enough teams for two tiers, all teams will play in the same tier. Please remember to select the tier you would like to play in while registering. Mercy Rule: If a team is leading by 5 or more goals the game is stopped and the team leading is awarded the win. All players will then put their sticks in the middle and the referee will mix them up and ‘throw sticks’ to two different ends of the ice to scramble the teams. The players will then pick up their stick and play the remainder of the game for fun with their new team. All games will be played on the Clearwater River at Snye Park. There will be a total of 10 rinks – 9 tournament rinks, and one feature rink. The games are 30 minutes in length and have a five-minute halftime break. The focus of the tournament is to celebrate winter and recreation in our region. Remind your coaches, parents, players and others to have fun, and to be respectful with one another. Shootout on the Snye will feature a fun and exciting Skills Competition on Saturday, February 23! This competition is open to all age groups; however, players will only be competing within their team age groups. If interested in participating, please ensure that you check the box when registering. More information will be provided in your Team Packages – obtained at Team Captain Orientation taking place on February 15, 2019. It is a drop-in event taking place at McMurray Experience from 12pm to 8pm.